» Reviewed by William F. Deeck: BARBARA FROST – The Corpse Died Twice. Reviewed by William F. Deeck: BARBARA FROST – The Corpse Died Twice. BARBARA FROST – The Corpse Died Twice. 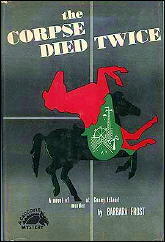 Coward McCann, hardcover, 1951. No paperback edition. Though suffering from a severe hangover, Jerome Carrigan doesn’t feel he deserves the obituary published in a New York City newspaper. He calls upon Marka de Lancey, attorney at law, to investigate it and also asks her to check on an insurance policy he is considering purchasing. She doesn’t have time for the latter since Carrigan is found dead in a Turkish bath at Coney Island under suspicious circumstances. This is de Lancey’s second murder investigation with Lieut. Jeff McCrae of Manhattan Homicide. It is a moderately amiable non-fair-play novel. Bio-Bibliographic Data: According to Al Hubin in the Revised Crime Fiction IV, Barbara Frost (married name Barbara Frost Shively) was a publicity manager for J. B. Lippincott Co., an obvious rival to Coward McCann, who was the publisher of her four mystery novels. Bill is correct in saying that this is Marka de Lancey’s second appearance. He did not mention that there was a third, however, nor that Ms. Frost’s first crime novel was not a series entry. One source on the Internet suggests that the police lieutenant’s name was spelled “Macrae.” It is not presently known if he appeared with Marka de Lancey’s in all three of her cases. The Unwelcome Corpse (n.) Coward 1947. The Corpse Said No (n.) Coward 1949. The Corpse Died Twice (n.) Coward 1951. Innocent Bystander (n.) Coward 1955. Editorial Inquiry: Marka de Lancey’s first appearance was in 1949, making her perhaps one of the earliest female attorneys to appear in crime fiction. Who may have preceded her in this category? [UPDATE] 02-08-10. See comment #3. It isn’t a definitive answer, but if Jon Breen doesn’t know of any other female attorney who was a lead character in a mystery novel and who came before Marka de Lancey, then my money’s on the fact that there weren’t any. Inez Stapleton is a woman lawyer in Erle Stanley Gardner’s D.A. books. She goes to law school at the end of The D.A. Holds a Candle (1938), and returns in later volumes. She is not the central series character, however. Two-fisted lawyer-sleuth “Betty Bates, Lady at Law” in Hit Comics being long running series in the early 1940’s. It is barely remembered today. Inez Stapleton may not have been a leading character in the Gardner books, but it’s nice to know about her, especially if she appeared in more than one book. Betty Bates is also completely new to me, even though I had a small stack of Hit Comics that I’d collected and enjoyed reading some 20 or 30 years ago. Maybe I didn’t have any old enough for her to have been in, or more likely, I’ve forgotten her altogether. 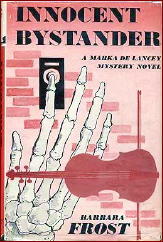 In NOVEL VERDICTS, I included Frost’s third novel, INNOCENT BYSTANDER, noting that Marka de Lancey was “ahead of her fictional times as an independent female professional.” I didn’t think much of the book otherwise and never read her previous two appearances. There may well be earlier women lawyers in crime fiction, but I don’t know of any. The movie comedy THE BACHELOR AND THE BOBBIE SOXER (1947) has Myrna Loy as a judge. It’s not a crime film. Jean Arthur played a woman lawyer on her short lived 1960’s TV show, also mainly a comedy. Radio’s The Defense Rests (also known as Defense Attorney) began on NBC in the spring of 1951 with Mercedes McCambridge playing the role of a female lawyer, MARTY ELLIS BRYAN. She spends little time in the courtroom and was usually on the streets, solving crimes. She is somewhat assisted by her boy friend, a reporter, played by Howard Culver (who had just left Straight Arrow where he played the lead and his secret identity, Steve Adams). After a few months, NBC dropped it so ABC bought it, cast and crew, retitled it “Defense Attorney” and ran it from the August of 1951 (originally as a summer replacement for Richard Diamond, Private Detective) and then through December 1952. But since Marka de Lancey’s first book came out in 1949, she’s still the one, until/unless someone comes up with somebody earlier. The book was published July 18, 1949.